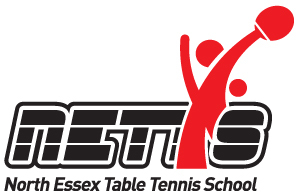 The club was co-created by former officers of Sudbury Table Tennis Club (across the border in Suffolk) and by the Braintree and District League. The Sudbury Club was at the forefront of table tennis development nationally when it piloted “TOP Club”, which later became PremierClub. After the Sudbury Club folded following the loss of their facilities, the ideas used and the experienced gained was transferred across the border into the Braintree area and NETTS was born, to be based at a new hall at Gosfield School. This village location proved difficult and with a lack of social facilities and problems with finishing times we decided to move to Earls Colne Recreation Club, which has proved an excellent decision, with its good catchment area (for rural Essex!) and easy access from neighbouring towns. In terms of our playing programme over the years, developing young players and helping them reach their potential has been at the forefront of our clubs philosophy since inception. In addition we have tried to introduce new playing formats for local table tennis for all standards. After experiments with 2-a-side and Individual Leagues, we developed the “Mini Top 12” format that has proved extremely popular and this helped us increase our membership following its introduction in the 2004/2005 season. By 2011 we had to scale down our activities due to a deterioration of the lighting, which reduced membership to around 30 players from a high of 60. Club Secretary & Head Coach Paul Davison kept the club going over the next few years with coaching twice a week and local league play now the main activities at the club, following several years in the Senior, Women’s and Junior British Leagues. In 2016 increased local enthusiasm led by Club Captain and Coach Derek Kennard, saw a weekly Friday Night club night being introduced. A new Chairman, Peter Hardy and a new Head Coach, Aad Kwakkelstein were appointed swiftly followed by a new committee in December 2016. At the clubs AGM, founder member Brain Davison was made Club President. With up to £10,000 funding available from Table Tennis England, the club saw this an opportunity to upgrade the lights. Paul Davison made the application entitled “Lighting for Lift Off” and match funding was secured from a variety of sources both withing the table tennis family and the local community. We were extremely pleased to hear that this bid had been successful and new lighting was sourced and then installed in early April 2017. A “Lift Off!” event was held on 14th May 2017 to promote the new lighting and to thank those organisation’s that had contributed to our scheme. Table Tennis England Board Member and former NETTS player Kelly Skeggs counted down to the big “switch-on” as the dimmed lights were raised to the maximum setting, for the delight of those present. With Summer League and Top 12 events planned for the 2017/2018 season, will Sunday 14th May 2017 be looked back on as the “Rebirth” of NETTS?